In this day and age, the infuriating kid isn’t the one who doesn’t believe in deodorant or the one always mooching off your lunch. 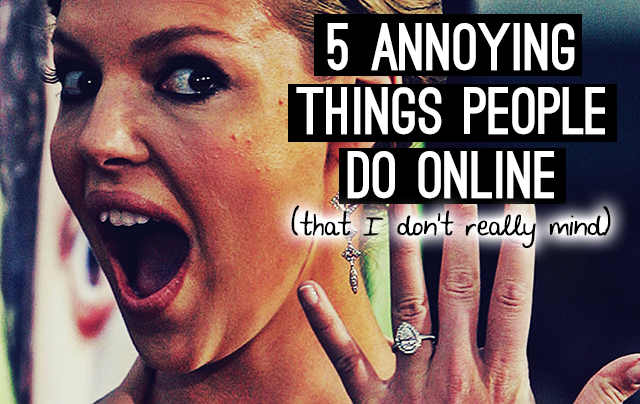 We now live in a world where the most offensive crimes of annoyance are those committed online. For some reason, people on Facebook seem to treat these like you’d treat a Lego on the floor in the middle of the night: one of the most unforgivably painful things anyone could be so unlucky as to endure. I’ve seen whole articles outlining the reasons why engagement announcements on social media are secretly works of the devil. Or worse: Michael Vick or the lady in charge of the Obamacare website. But I just don’t really get it. I mean, we’re all on Facebook to stalk anyway. How are we going to do that properly if people leave out the juicy stuff? Plus, it gives you free license to post pictures of your bling when you get hitched. Why would anyone want to deprive a girl of that most anticipated event after the creation of her Wedding Board on Pinterest? Whenever there’s any sort of slightly out-of-the-ordinary weather pattern, social media immediately divides into two sides: people posting about said weather pattern and people complaining about the first group. I mean, I don’t particularly enjoy seeing twenty pictures of the snow at 15 different angles (except when it’s -15 degrees outside; then I’ll be the first one out there tweeting that dead horse with all I’ve got). But I also am not offended if someone has the audacity to tell me that it’s raining. I’ll admit that this one can look a bit stupid. When people post pictures of their food on Instagram with captions like “look at this #macandcheese that my #mom #homecooked #delicious #yummy #foodporn #likeforlike #Muenster #carbs #American #family #liberty #getinmuhbelly #pastafordays #YOLO,” they look sort of foolish. But so what? They’re not forcing me to add 20 irrelevant hashtags to the ham sandwich that I just posted. If anything, it actually makes my X-ProII-filtered Subway 6-inch look that much more sophisticated by comparison. As I mentioned in the first point, the main purpose of social media is publicly acceptable stalking. So why would anyone complain about people giving TMI? If anything, they’re just making it that much easier for us to gather the vitals, like how they voted in the past election and what brand of toilet paper they use. If you ask me, the rest of social media should really get up to speed with this one so I don’t have to waste time searching your profile for your thoughts on "Love Actually". I actually wish my mom was on Facebook. Subtly hinting that you need something (for example, money) is much more effective as a status update than a text. I mean, how often can you realistically hope she’s going to buy that you’re just talking about your electric bill in passing? To put this gently, that’s some pretty stupid advice. There’s nothing we really need to put online; it’s really up to us what we want to share. Humanity existed before Instagram filters so if we’re only going to post what’s necessary, there’s not going to be a lot on my news feed. I guess all I’m trying to say is this: post whatever you want online. If I don’t like it, I’ll just unfollow you. Unless it’s something about the Steelers. Then I’m going to demand you remove such garbage immediately. Happy Friday! Get on out there and take a few selfies. ... And make 'em better than this one. Linking up with Sarah because I'm secretly a fan of all these things. Also linking up with Whitney, because that makes the last hour I spent rocking out like it's 2003 somewhat legitimate. Great post dear.i agree some of habits like the 1st one are annoying.